To the best of my ability, I have determined that Disney’s Purchase of Marvel Comics is neither a hoax, nor a fever dream, but indeed a reality, true believer. 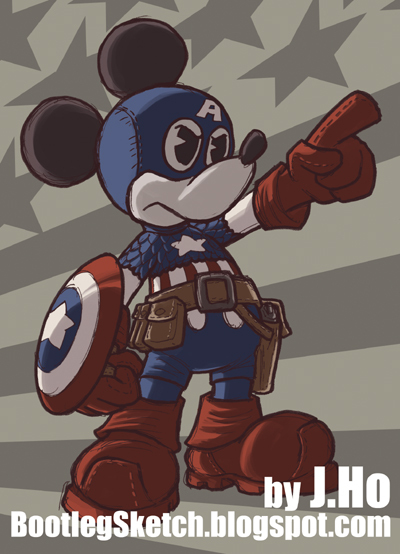 To that end, I demand that you produce the Disney/Invaders ongoing series that fans have been clamoring for since the 40′s. Also, I demand that you negotiate with Warner Brothers/DC Comics, so that we may also see the long awaited Disney/Invaders versus Looney Tunes/All-Star Squadron crossover. I would be happy to write and draw these books for a nominal fee. Enclosed is a piece of sample art, proving my nerdish devotion to pointless, but awesome, crossovers. The pose is loosely based the standard Mickey Mouse images turned up by my internet research. This whole thing took me about three hours, which is fast for me. Yes, I’m painfully slooow. Hmmm… I’m not sure if this piece is a success or not. On the one hand, Jessica Rabbit is not (and should not be) subtle. But on the other hand, my drawing goes a little too far in the opposite direction and is sort of… trashy? There are other problems with the drawing in general, but I am pleased with the face/hair, and the solution I came up with for rendering sequins. Live and learn. Should I draw Holli Would next? Welcome to the very first Bootleg Sketch Mega-Event(TM): that’s right, it’s Duck Week(TM)! What does that mean? It means that I’ll be drawing ducks this week. Yes, that’s right, ducks. I stuck with my own style and I changed a few details here and there, but this is still a pretty straightforward interpretation. Incidentally, if it’s not obvious, Gizmo Duck is supposed to be screeching to a halt. I’m happy with my color selections, though the shading, such as it is, is very basic. 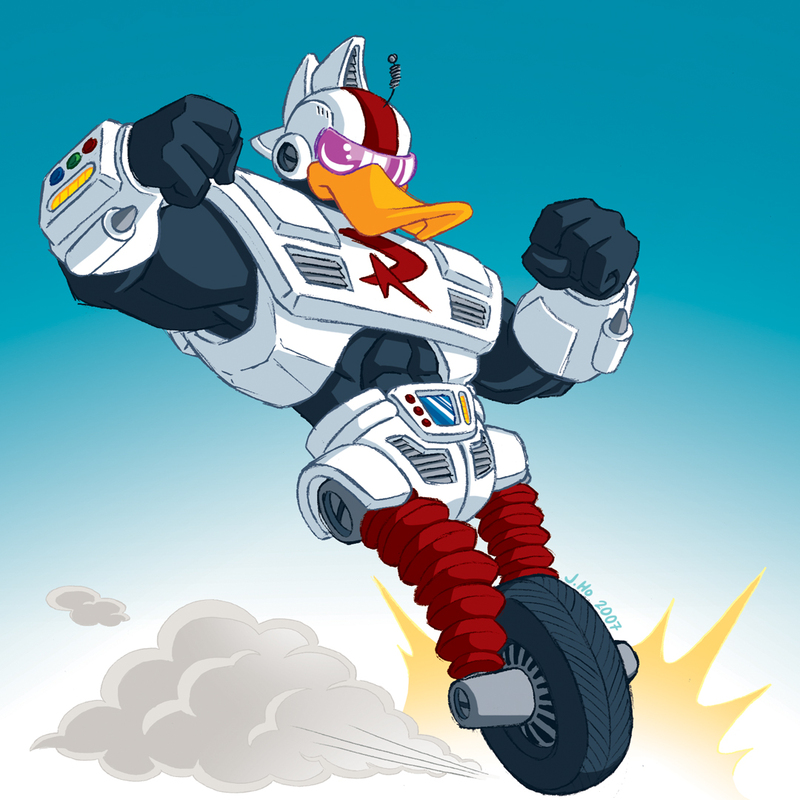 The background color was a last minute addition to distinguish Gizmo Duck’s white armor from the white background. Check out the other entries in Pencil-Ninja’s jam at this link, and stay tuned for more DUCK WEEK(TM), including a bonus review on Wednesday and another Duck-Sketch on Friday, right here, on this very Blog! BELIEVE IT!